How Do I Know if a Dumpster Will Fit in My Driveway? If you’ve got a serious trash removal job ahead of you, the best thing to do is often to rent a dumpster. But you may have some questions about what to expect if you’ve never rented a dumpster before. Here’s the information you need to prepare for bringing a dumpster to your home. How Do I Know a Dumpster Will Fit in My Driveway? Hometown Waste and Recycling Services, Inc. offers dumpsters ranging in size from 10 to 40 yards. These dumpsters are eight feet wide, so there should be plenty of room in your driveway for the dumpster. Our 10-yard dumpster is about the size of a four-door sedan, so use that to gauge how well the dumpster will fit in your driveway. To maximize our ability to deliver your dumpster and place it conveniently in your driveway, please make sure there is nothing in or around the driveway when the dumpster arrives. All cars should be inside the garage or somewhere on the street. You should remove any debris or toys and you should take care of any low-hanging tree branches or wires if they encroach upon driveway space. While the dumpster is only four feet tall, it’s a good idea to make sure there are about 14 feet of clear vertical space to accommodate the height of the truck and a raised flatbed. Also, the truck will need 50 feet of space to back into your driveway and drop off the dumpster, so make sure there’s a clear runway of 50 feet for the truck to use. Do I have to worry about whether or not the dumpster will damage my driveway and how do I protect my driveway from dumpster damage? 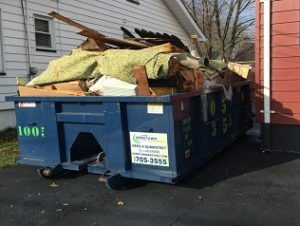 While we do not expect the dumpster to damage your driveway, we can put wood down and rest the dumpster on top of it to alleviate any concerns. When you order your dumpster rental, you will get a delivery date — typically within a day or two of your order. Usually, you can expect your dumpster to show up any time during business hours, as the driver may have a number of dumpsters to deliver on any given day. Be prepared for your dumpster to arrive during that window unless the company informs you otherwise. If you’re looking for dumpster rental in New Jersey, Hometown Waste and Recycling, Inc. has great dumpster rental service at great prices, and you get $25 off your first order. For a free quote, give us a call at 732-525-2555 or contact us online today.